The ENRICH Project has developed an interactive, open-source, community-based map online which can be browsed below, or viewed in a larger version here. This guide was designed to help you get oriented with the online mapping program, so that you can easily navigate and manipulate the map data. A downloadable PDF version of this tutorial is available here. 1. All data that is available on the map will be present in the Table of Contents. 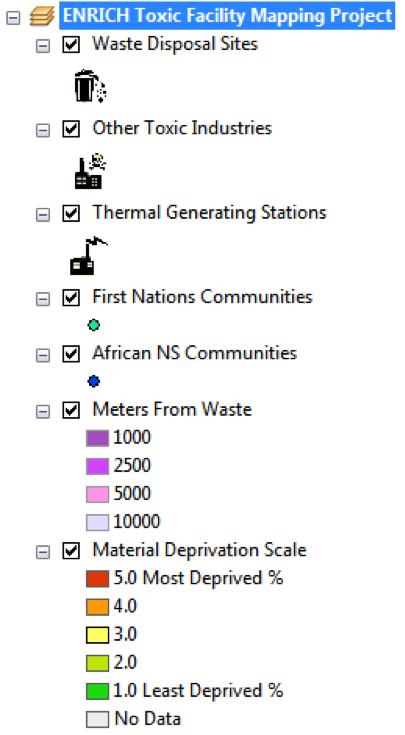 We can see here that Waste Disposal Sites, Toxic Industries, and Thermal Generating Stations are all present in the map data (each of which have their own corresponding icon for easy identification). We can also see that there are icons for different communities. Following the Community data, we see that there are four boxes with progressively lighter shades of purple. These boxes correspond to circular buffers that radiate out from a hazardous waste facility, which show the distances from the central waste area that communities may fall within. The multiple colour boxes that follow represent the Material deprivation of each area in the map. 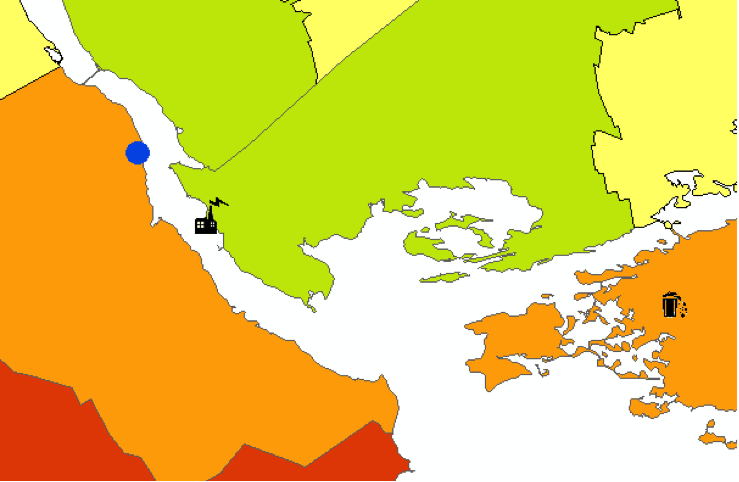 These colours will correspond with the background map, and show the Material Deprivation as one of the five colours. 2. In this image we can see examples of the data contained in the table of contents. We can see three different icons in this image. 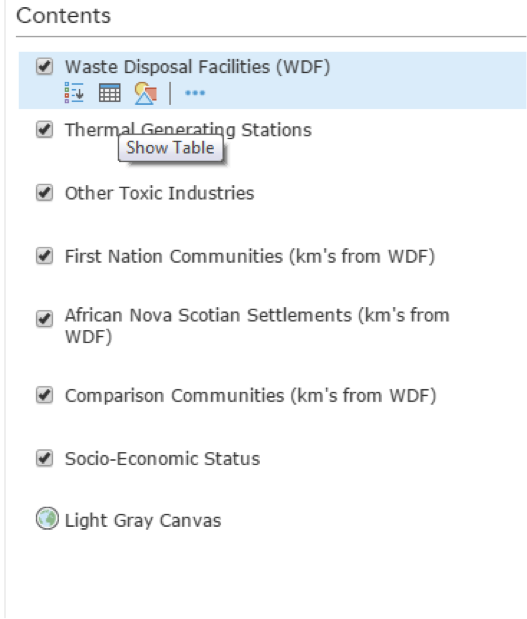 These icons are a community (denoted by the blue circle), a thermal generating station (denoted by the power plant symbol), and a Waste facility (denoted by the trash bin icon). In this image we can also see the multiple ring shaped buffers that radiate out from each hazardous size to distances of 1 km, 2.5 km, 5 km, and 10 km from smallest to largest rings. 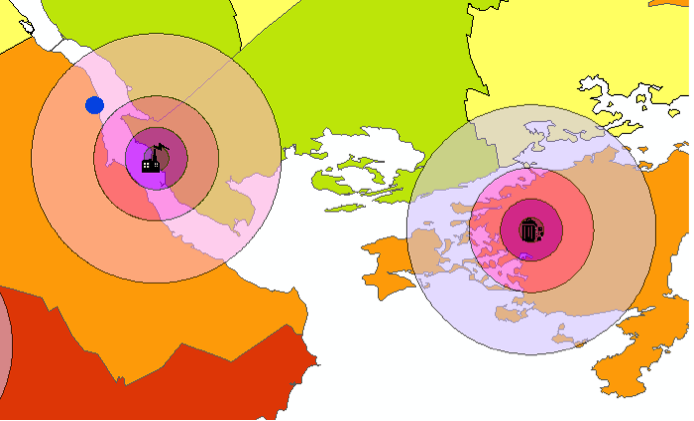 These rings show the proximity of communities to each hazardous facility. Finally we can see the where each geographic area falls within the Material Deprivation Index, as denoted by the background colour (where red is most deprived, and green is least deprived). 3. When we don’t want an item to appear on the map, we can easily remove it from the map by deselecting the item’s checkbox on the table of contents. This doesn’t remove the data altogether, rather it just makes it invisible. To make the data visible, simple recheck the box. 4. As we can see in this image, the thermal generating facility has been turned off in the map, leaving all the other data present. 5. It is possible to turn off any data, such as the distance buffers. In this case we can more clearly see the location of the community in relation to the thermal generating site, however the distance from the site is now less apparent. 6. It is possible to turn labels on for different items on the map. 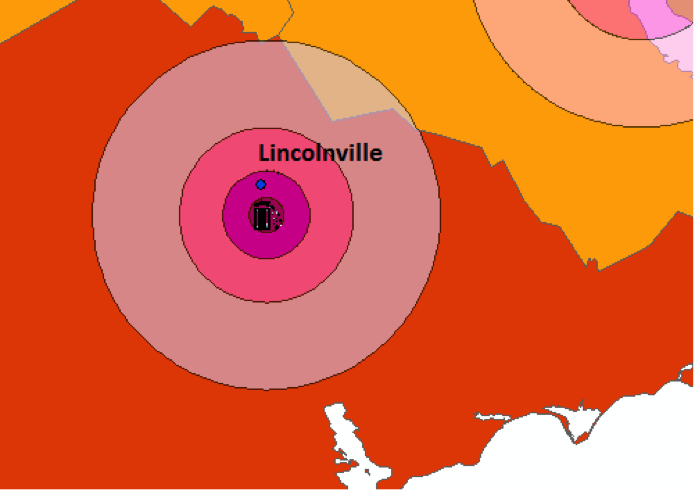 Here we can see the community of Lincolnville (blue dot) labelled clearly. 7. 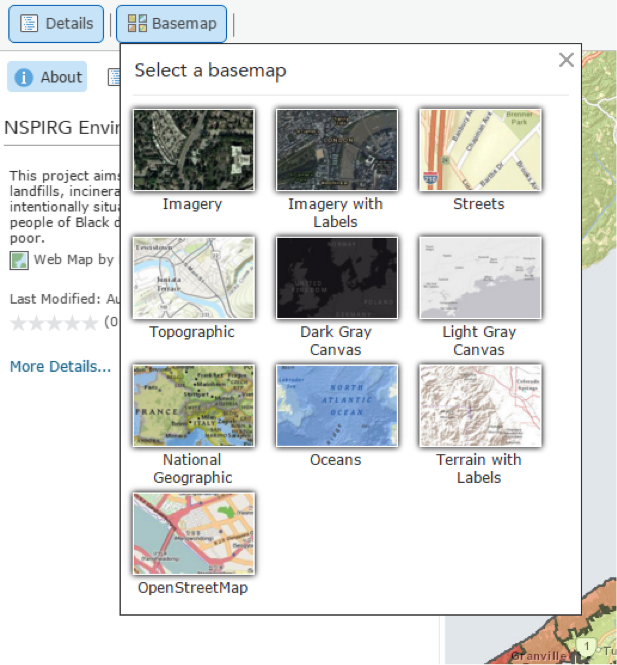 For ease of viewing, it is possible to select one of several basemaps. These basemaps will fall as a layer behind the map data, can help show the terrain, roads, etc. 8. The zooming tool at the top left of the map allows you to zoom in and out of the map for ease of viewing. The home button allows you to view to the map’s full extent easily. 9. When more data is desired, you can select the small table icon under any data layer. By clicking this little spreadsheet icon, you can bring up all the extra data present in that file. 10. We can see in this image the name of some Waste Facilities, the type of waste they handle, and their address. 11. Alternatively you can simply click on a feature in the map itself. 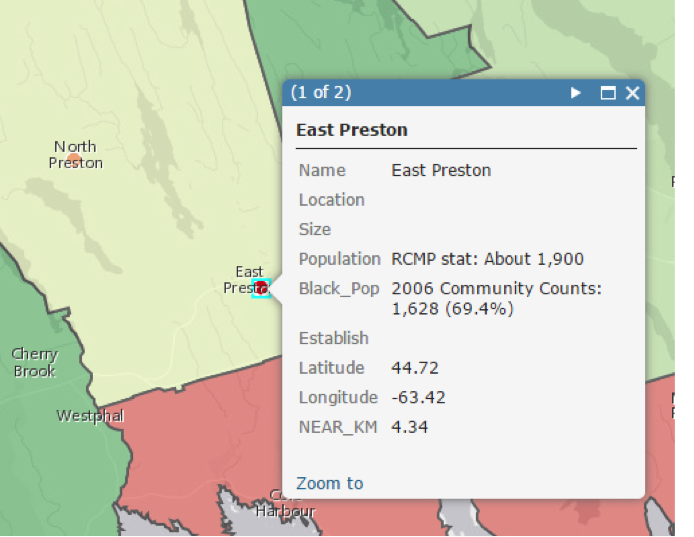 Here we can see additional data for the community of East Preston, which has popped up in a window directly on the map. Information such as population numbers and location are present in this case example. 12. When you wish to make measurements directly on the map, simple select the measurement tool to perform this task right on the map. On this toolbar you can also save or print your map, and even search for a location on the map. 13. Finally, for more advanced users, it is possible to directly import spatial data directly into the map itself using that add tool. Terashima, M., Rainham, D.G.C., Levy, A.R. Should We Enhance the Commonly Used Deprivation Index for a Regional Context?. Canadian Journal of Public Health. 104(4):e311-e316. Material deprivation (including average individual income, proportion of people with no high school diploma, and employment-to-population ratio) represents the relative socioeconomic condition of the population across communities. In the ENRICH map, the colours present in each area represent the relative material deprivation for that area. 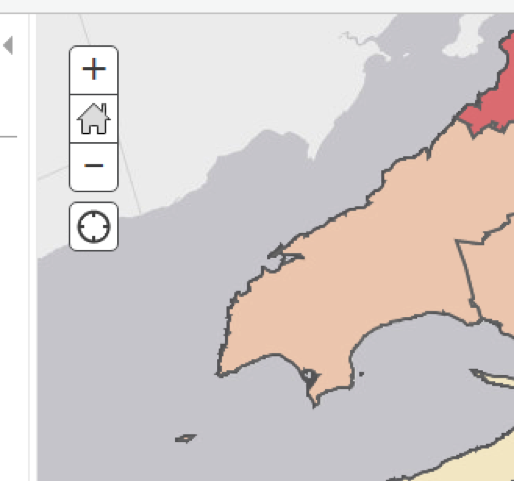 Facility Location, Materials utilized, and generating capacity information gathered from Nova Scotia Power [Online] Available: http://www.nspower.ca/en/home/about-us/how-we-make-electricity/thermal-electricity/default.aspx. Location GPS coordinates gathered from Google Maps. Pulp and Paper Site Location and Details. 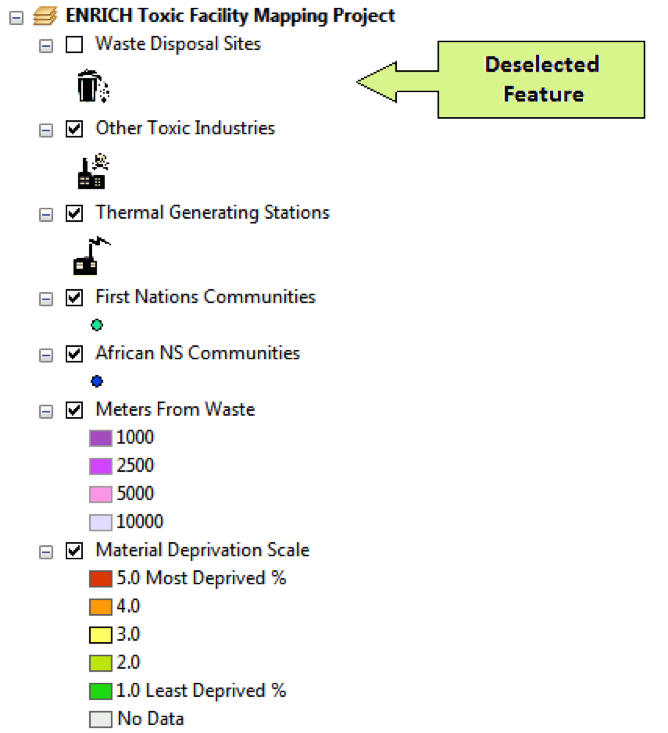 Facility data and location data gathered from Northern Pulp website [Online] Available: http://northernpulp.ca/manufacturing. GPS location data gathered from Google Maps. The use of multiple ring buffers of increasing distance is supported by research by Neumann et al., 1998; Perlin et al., 1999; Sheppard et al., 1999; Atlas et al., 2002; Perlin et al., 2002; Pastor et al., 2004; Walker et al., 2006 that all utilized multiple ring buffers of three or more (as outlined in Maantay et al. 2010). According to Maantay et al. (2010) the use of multiple ring shaped buffers provides a more realistic geographic representation of the potential exposure hazard. This same study reviews a body of literature suggesting that the separation distances from hazardous facilities are likely inadequate, and that contaminants can travel kilometers and directly cause a variety of adverse health outcomes. This supports the use of multiple ring buffers of distances up to 10 km, with proximity being inversely correlated with risk levels, where the closer the population is to point sources, the higher the risk of exposure and adverse health outcomes. Furthermore, a review study by the BC ministry of Disease Control (2012) presented findings of various studies suggesting that adverse health outcomes (from various pollutants) can be related to point source contaminants from waste disposal sites at various distances for each study, which ranged up to 10 km. Mantaay, J., Chakraborty, J., Brender, J. 2010. Proximity to Environmental Hazards: Environmental Justice and Adverse Health Outcomes. Prepared for the US Environmental Protection Agency. Created by Beau Ahrens as part of the ENRICH Project. Note: The ENRICH Project is developing further on this map with detailed health, socio-economic, and anecdotal information from multiple diverse sources, a multimedia upload section, a research data request form and educational tools available for download. To learn more or get involved, please contact us. The ENRICH Project is a collaborative community-based project investigating the cause and effects of toxic industries situated near Mi’kmaq and African Nova Scotian communities.